Last night I taught “The Practice” at the Yoga Center. The practice is normally 3 hours and is different than a class and a workshop in that it is not led; it is a practice where the student and the teacher all practice together. The teacher gives less ques and calls out the poses. I really enjoying going to the practice because I find it really effective, by the end of three hours I can get myself into some really incredible poses and I leave feeling great and feel like I learned so much about asana, philosophy, and about myself. I have always loved being a student of the practice and it is very exciting to have taught one. The practice at the yoga center was only 2 hours, but two hours of fullness and heart! There were 9 students, at the beginning of class one of the students an older man said he would have to leave an hour early. I said that was just fine (in my head I thought maybe he was disappointed that I was subbing and was trying to get out of it). The whole class the students were laughing, we even told some jokes. The end of the class came and the man never left after I said “I thought you needed to leave early” and he responded saying “he was having too much fun”. How awesome! Main universal principle of alignment focus: inner/expanding spiral and outer/contracting spiral. We chant this wonderful mantra at the beginning of every Anusara class, but do you know what it means? I absolutely love this mantra. I love the way it vibrates through my body and the way it sounds. I love the way I feel during and after I chant the mantra. I love the energy it invokes. Om Namah Shivaya Gurave: The sound of the universe (Om), I bow down, I honor and I offer myself to (Namah) to the Highest, the Auspicious one (Shivah), who is the weighty teacher leading us from the dark to the light, that resides within my own heart and outside of me (Gurava). Satchidananda Murtaye: Who assumes the forms of Truth, Reality, Consciousness, and Bliss (Satchidananda), this is the essence (Murtaye) of this Teacher that is within our own heart and that surrounds us every where. Nishprapanchaya Shantaya: This essence is never absent (Nishprapanchaya) and is full of peace (Shantaya). Niralambaya Tejase: This one energy is completely free and does not depend on anything to exist (Niralambaya), and this essence is a radiant luminosity, and is sparkles from the heart (Tejase). Om Namah Shivaya Gurave: I honor the essence of Being, The Auspicious Once, the luminous Teacher within and without. Satchidananda Murtaye: Who assumes the forms of Truth, Consciousness, and Bliss. Niralambaya Tejase: Ultimately free and sparkles with a divine luster. Our practice on the mat is an act to help us remember this. To help us remember that this higher teacher (whatever that higher teacher is to you: mother nature, science, god…) who is full of Truth, Reality, Consciousness, and Bliss. This essence pulsates with bliss (ananda) and sparkles (tejase). This one energy doesn’t need any set of circumstances to exist and is always present within us and around us. I love when I am practicing on my mat whether I am in a public class, a workshop, or at home. When I really tune into my heart and move with grace I can feel this inner pulsation of peace. I feel alive and vital yet at ease and calm. When I am in this state, I feel like my heart is sparkling (tejase). Lately as I have been working on this I have been working the legs. I feel like if I don’t have a good base, a good foundation I can’t begin to connect to this inner radiance. From the four corners of the feet (mound under the big toe, to the inner heal, over the top of the foot diagonally to the mound under the pinky toe, and them back to the outer heel). From this strong active foundation in the feet draw in energy up the legs toward the core of the pelvis. In standing poses, the back leg will naturally have more outer spiral so you again balance it by applying more inner spiral. As you work the inner spiral also focus on the femur bones back. My new trick for femur bones back is by putting my back hand on my back hamstring high on the thigh and then pushing my femur bones back until I can feel pressure on my hand (I take that pressure as a sign that I am doing enough femur bones back). 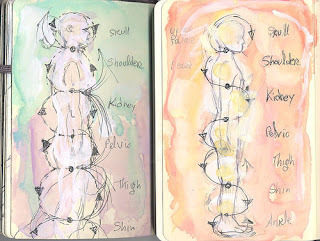 The front leg will naturally have more inner spiral so you want to focus on balancing that by apply more outer spiral. In other words, scope the from sit bone under like you are trying to push your front heel into the ground and forward. When you do this you should feel space being created around the front psoas muscle. In Anusara we have a saying “root down to rise up”. I also think if you root down or have good foundation, muscular energy, inner spiral and outer spiral in the legs will allow you to experience your own inner radiance, experiencing your own inner sparkle, experience the pulsation of bliss. I think it is important to practice on our mat so we may connect to what it feels like to pulse with peace and feel our heart sparkle. It is also important to remember that we don’t need to be on our mat to have this experience because this experience and essence is always available to us…we just need to remember. A great way to do that is through chanting the Anusara invocation and practicing asana. Brahma created the universe out of Lila out of play. In myths there are many different names and figures that represent The Highest. What ever figure is representing The Highest is also called the Godhead. Depending on which culture the myth originates will depend on which character will be used to represent the Godhead of the Supreme. In this story from India, the Godhead is Brahma. Brahma is the Supreme one energy and in the beginning of this story nothing existed but Brahma. Imagine one big green blob which is Brahma. This green blob is totally divine and has the “Essential Attributes of the Absolute” including: absolute Goodness, Being, Consciousness, Bliss (Sat-chit-ananda), pulsation, self-awareness, ultimate freedom (Svatantrya) and perfect fullness (Purnatva). Since all that exists is Brahma (this green blob) he gets bored and decides to play a game, but he has no one to play with. So out of his ultimate freedom (Svatantrya) he creates the goddess of illusion Maya. 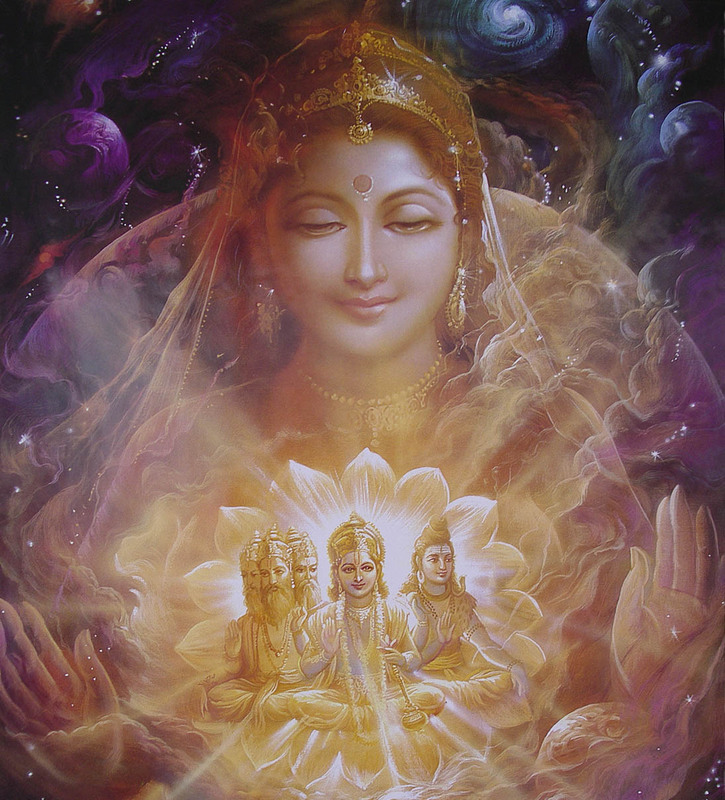 Brahma told Maya that he created her so he could play a game. Maya told Braham that they will play a wonderful game, but Brahma has to do what she says, and Brahma agreed. Maya first told Braham to create the whole universe, the stars, moons, and the planets. Brahma created earth with animals, plants, oceans, air, and everything. Maya then said “How beautiful is this world of illusion you created, now I want you to create a kind of animal that is so intelligent and aware that is can appreciate your creation”. Brahma created humans. Brahma was getting excited and wanted to know when the game would start. 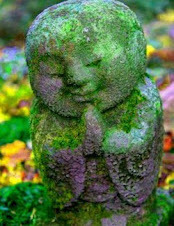 Maya said right now…Maya cut Brahma (I still imagine at this point that Brahma is a green blob) up into thoughts of tiny little pieces. She put a little piece of Brahma into every human and said, “Now the game begins! I am going to make you forget what you are, and you are going to try to find yourself!” So this is why the universe exists. It is out of Lila (playfulness), because Brahma wanted to have fun. So the game of life is Brahma trying to remember who he is. Brahma is inside of each one of us. Each one of us is part of the divine. However, Maya is stopping us from remembering our true nature. How cool is that! I have been learning and studying this story a lot. I have finally found a way good quick to summarize this fascinating story. I used to have a problem with the idea of maya. Maya is this cloak that covers up and hides things from us. In this story she is covering up our inner divinity and making us think that we are not whole, we are not complete, that we are not perfect, that we are not divine, that we are not worthy…. I didn’t like maya because I thought she was mean and evil for hiding these qualities, hiding the fact that we are Brahma. But now I see that she did it out of play too. She is just playing a game. She is actually playing a game with us. And instead of getting mad we can choose to play as well. We can play this game of lila by working and studying and trying to remember and uncover who we are at our essence. Not just remembering that at our essence we are supreme but remembering that everyone has this same supreme little piece of Brahma with in them. My airport experiment: I have heard this story in more detail many times and it was when I was reading the mastery of love by don Miguel Ruiz that I could summarize it quickly and see that Maya is playing with us as well. I read this story when I was in Fiji and on our trip back home (it was long 11 hour airplane ride from Fiji, 9 hour layover in LAX, 2 hour air plane ride back to SLC). So I had a lot of time to people watch. And instead of looking at people and judging them for this or for that I would look at each person and think to myself “Brahma is in him, or her, and in that little girl, and that old man, and that person with lots of tattoos….” I would then take a moment in between looking for the divine with in other people and to remind myself that the divine energy that I am looking at in them is also in me. This was a really cool exercise, at first when I would looked at each person I would see their age, gender, style… before seeing their inner light and saying “Brahma resides in them”. After doing this for a while but after while all those categorizes my mind sorts people into went away and I would just saw their unique oneness radiating from each person in a different way. Recently I have been playing with the loops. 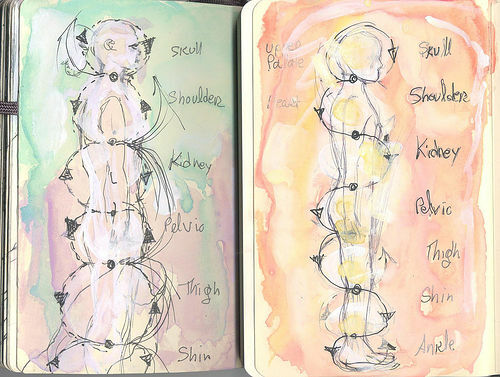 The “loops” are a series of specific, interconnected trajectories of energy in our bodies. Just like the universal principles of alignment, we want to be practicing all seven loops in every pose we do. By being aware of these interconnected loops in the body we can start to notice how we hold our body while practicing yoga asana or the way we habitually hold our body in life. With this awareness we can use the loops so we my create more health, stability, longevity and freedom in the body. Although it is important to focus on all seven loops, recently I have been focusing on the ankle loop (base of the shin bone back) and skull loop (pallet of the mouth back and up). Ankle loop is very important because if you don’t have the base of your shin bones anchored back toward your heel, you will be ungrounded and you will mess up the foundation thereby throwing all other loops out of balance. Here is a brief summary of how not having a good ankle loop you will throw off the six other loops above it. If the base of your shin bone is not back (ankle loop) you will set off a dominoes effect of imbalance all the way up toward you head…The top of your shin bones will probably be pushed back (opposite of shin loop=hyperextension at knee)..The top of the femur bone will be pushed forward (opposite of thigh loop = hurting hip muscles, psoas, iliofemoral ligament and causes low back pain and Sacroiliac joint pain)….The pelvis will rotate forward sticking the belly out (opposite of pelvis loop= removes the low dorsal curve in the back pushing sacrum down and out causing compression in low back)….The bottom ribs will push forward (opposite of kidney loop= compressing the kidneys)…the shoulders round forward as if you were protecting the heart in battle (opposite of shoulder loop= causing lots of shoulder and neck problems)…lastly the pallet of the mouth will move forward (opposite of skull loop= compresses the neck + shoulders forward and chin forward is just plan painful). You can see by just rooting the base of the shin bones back toward the heel you can help create a lovely dominoes effect up the loops. I have enjoyed focusing on ankle loop and skull loop at the same time because the skull loop is like the cherry on top. Skull loop starts in the upper palate and flows back to the base of the occiput, where it then lifts up the back of the skull, creating lengthen in the neck. Whenever I add a good skull loop to a pose I feel confident and radiant. Adding skull loop also helps maintain shoulder loop, keeping the shoulders integrated behind the heart. Try this for a moment. Sit up or stand up and look forward as you draw the tips of the shoulders toward the back of the heart, really “plug in”. Notice how this feels in the shoulders and in the heart (shoulders probably feel integrated, heart probably feels open). Now drop you chin toward your chest, this is the opposite of skull loop (I like to do the completely wrong action sometimes so I know what the results feel like). After dropping your chin toward your chest, did you feel the shoulders slightly lose the integration and the heart slightly sinks? Even if you use really good muscular energy when you take your chin toward your chest you will lessen your shoulder loop. Try this now, plug in and then pull the pallet slightly back and up and lift the ears up. Do you feel how the shoulders stay rooted, the heart stays lifted, and maybe you can experience more inner body bright? I really like focusing on ankle and skull loop together because it reminds me to stay grounded and reminds me to create space confidently. I said this earlier but it is important to practice all seven loops all the time. Even when I am focusing on ankle loop and skull loop doesn’t mean I stop doing shin loop, pelvis loop, kidney loop, and shoulder loop. Here are some fun poses I have been working with: handstand, headstand, forearm balance, side crow, titibasana, trikonanasan, urdhva danurasana, chaturanga, half moon, parvrita Parsvakonasana, Parsvakonasana, arm balances, Setu Bandha Sarvangasana, side plank with extended leg…. My past few blogs have mentioned the course I am taking from Elena Brower called Living Your Yoga. This course is intended to be a five day course where Elena tells you what your assignment is for each day and then gives you some homework questions to help you reflect on your day and how the assignment went. I did day one pause, where I focused on noticing physically in my body when I contract and when I expand. I worked with using my breath when I am in a contraction to bring about and active expansion. This was wonderful. It brought a lot of light to me about which situation and habits cause me to contract. And it also helped me learn that when I am contacting depending on the situation sometimes the breath removes the contraction completely and allows me to expand into love and acceptance. However I have also learned that shifting awareness in my breath when I am contraction doesn’t always make the contraction go away but it does help me stay present to what is causing the contraction, it helps lesson the contraction, and it helps me learn more about myself. The day after I did day one, which should have been the day of self acceptance, day two. As I went throughout the day I was just so aware of the pulsation of contraction and expansion I kept for getting about my day two assignment. So I decided to focus on day one for a week…. If you are waiting on my day two reflection you’ll have to wait a little longer. I am really enjoying this course and am grateful to Elena for offering such an accessible class to students. *NEW CLASS: I will be teaching a new class 12-1 at the yoga center starting at the August 7th. **Reminder later today is the practice with Jen at the yoga center 540-7. Tomorrow master workshop with Adam at lifted life yoga center 9-11am. There are many things I love about Anusara yoga, of these is the life affirming philosophy. I love how Anusara teaches you to see beauty everywhere and in everything. This includes our asana poses. When I started yoga, whenever I was in a pose in the back of my head I would think: what am I doing wrong? Am I doing the pose right? The practice has taught me that I cannot do the wrong thing, so my pose would be good. In my mind it was either you were doing the pose correctly or you weren’t.... However, Anusara says that no matter where we are in our pose (as long as we are not pushing into pain) we are beautiful. We are doing good. The practice and the fun begins by seeing how we can enhance the beauty that is already in our pose. As I wrote in earlier posts, I have been doing a course from certified Anusara teacher Elena Brower. On the first day we were told to notice the difference between expansion and contraction in our physical body. We learned that almost every contraction comes from the negative states of either rushing or doubting. We learned that if we can fine tune our attention to notice when we start to contract we can pause and breath and allow our self to experience the freedom of expansion over the limitation of contraction. I really love this. It reminds me of spanda, of this pulsation that under lies all life. John Friend once said that, “the whole universe is just one big pulsating ball of bliss”. We, you, me, your neighbor… are all intimately connected and apart of this blissful ball expanding and contracting. As I was initially thinking about this my mind wanted to think that when I was contracting that was a bad thing. Just like I used to think if my pose wasn’t perfect it must be completely wrong. Then I started to think about this life affirming positive thinking aspect of Anusara. I realized the contraction isn’t a bad thing at all. First, if there wasn’t any contraction there would never be expansion, but also the contraction is bad. The contraction is hiding our greatness from our selves. So we are always great, we are always powerful, we are always perfect, and we are always whole….However it is when we contract that we forget and we think we are bad, we are weak, we are undeserving, and that we are missing something… But just because we have forgotten as we contract does not mean that at that moment when we are so tight, so closed in, even in that moment we are magnificent. When we pause, when we breath, when we remember that we expand! This was the theme for my class this morning at Flow Yoga EMC 9:15-10:30am. The class was great I have been out of town and missed the past few classes and I was so surprised and happy to walk in and see a room full of familiar faces and friends (many Anusara students which is always fabulous) who came with me for the one class I teach at flow before I leave for one last trip (rafting down cataract canyon). We had lots of fun we focused on expanding (inner) and contracting (outer) spiral. Tonight teaching at the yoga center 5:40-7pm. Can we experience the expansion and contraction of this pulsating ball of bliss? As we notice that we contract can we not get discouraged and think we are bad, but can we remember the pose we are in, and who we are is perfect! I have been focusing on Day 1 of Elena Brower’s Yoga of living course. This first day is called PAUSE and Elena encourages us to notice the difference between expansion and contraction in the physical body. She says that contractions are almost always caused by two negative states caused by rushing or doubting. She then says when you notice yourself contracting “take one breath to shift from contraction to attentive expansion”. 1.Write down at least 3 occasions when you noticed a contraction, what preceded it? Where it was in your body? 2.Were you were able to transform it into an expansion using the breathing? What did that feel like? I really am enjoying today’s assignment. Using my attention to notice when I am expanding and when I am contracting. When I am expanding I feel open, spacious and full of love. When I expand I feel big and powerful, but at ease and full of acceptance. When I am contracting I feel closed, sad or anger. When I am contacted I feel so small, weak, unsure and so wrapped up in myself. As I work up this morning I stated my intention. I took a few deep breaths and I noticed how this act of breathing with awareness helps me expand. As I started my morning I started by experiencing this wonderfully open state of expansion. As I moved about my morning I keep my attention of this expansion and contraction. There were many times as I would be doing something that I could feel this contraction. I could feel myself getting small. Being a yogi I am very aware of my body, when I felt myself contract I felt my back slightly round, and my shoulders roll forward. I could feel my brain hurt. As I started the day I knew I would have many contractions but I was surprised how many I noticed and how such little things would set them off. I did notice that every contraction was caused by me judging/doubting myself/others or from me rushing. •I was thinking about how I already love this course from Elena Brower and how excited I am for working with the next assignments. Then I thought about sharing it with others…on my blog and my friends and fellow teachers. It was in this moment I contracted. I doubted how much knowledge I already have, and I wanted to hoard this wisdom and keep it to myself so I could be the best. I felt myself contracting and tightening from my brain, my heart, and into my core. I was driving my car and I felt my back slightly round like a scary Halloween cat as my shoulders rolled in as if I was protecting my heart. I paused as I noticed this, and I turned to my breath. I wasn’t even trying to figure out if I would share this knowledge or not. As I shifted my awareness to my breath I naturally sat up straighter (inner body bight) and corrected my shoulders (shoulder loop, who knew you could practice Anusara in the car). I felt myself starting to expand from my pelvis, up my ribs and out my heart. I felt open and full of gratitude, and my head felt more spacious. In this new state of expansion the choice went away, of course, I would share this knowledge. ohttp://www.artofattention.com/ sign up for the email list sign up and you will get emailed a password, then you can access the course from that same webpage. •Tyler (my husband)and I have been looking for apartments. I wanted to turn in my application by 9am and we didn’t even leave the house until 10:30am. After we left the house we had to stop and pick up pay stubs and we had to go to the Social Security Building to get a recipt that says our SS# on it, since I couldn’t find our cards and the apartment wouldn’t accept our passports. This caused many contractions caused by rushing. oWhen we first got in the car after being an hour and a half late I could feel my heart beating and I was quickly calling the apartment office to see if anyone had turned in their application (we were told that 3 other couples picked up applications and it was all about who turned the application first). I asked if I could bring my passport instead of my social security card and she said no. After hanging up I noticed that I missed the start of this contraction and I was fully in it. I was rushing and not enjoying this moment. I thought just turn to your breath and expand. Unfortunately, this time it was not that easy. As I breathed I was also repeating the mantra “slow down…open” in my head. This did lesson my contraction but I was not experiencing expansion. My day continued like this. As I felt a contraction brought on from rushing I would pause and breath, this did lesson the contraction and allow me to open to the experience but I didn’t feel completely spacious and peaceful. However it was really awesome to be aware of this (noticing the contraction, bringing space to it and noticing what happens,,, a little less contracted) instead of just going through the day with each little thing continuing to close me off more and more and more. What I learned from today’s experiment was that I was able to use my attention to see when I tightened in on myself and then used my breath to open myself back up I was aware that if I didn’t choose to pause and breath and allow myself an opportunity to expand out of the contraction I would have stayed tightly contracted. I feel very fortunate that I often take time to breath, sit quietly, and practice yoga. All of these activities give me opportunities to expand. When I do them they help assist me to expand out of any contractions that occurred earlier. But what is difficult about this is I don’t know what the contractions came from so I can’t deal with them as appropriately and use them for growth. What I liked about this assignment is it has given me a tool to help me learn how to notice when I contract, what it feels like, and what causes the contraction. This knowledge teaches me more about myself, so I may be aware when I contract and when I expand, and hopefully through discipline and attention I can start to shift some of my habits and thinking processes so I can reside in this open, peaceful, accepting nature of expansion. In this course Elena gives an assignment, gives you something to focus on for one day along with some journeying homework to reflect on your experience. Upcoming events for this week!!!! Yesterday was so wonderful. A wonderful day of deepening my connection to my heart and the heart of the people here and the heart of the unity of the world. We found a wonderful Hindu taxi driver named “Sak” I believe, my mom kept calling him “Shakey”. I really enjoyed his company and his insight. Most of the people we encounter are Fijian, they tend to be heavy meat eaters and their main religion is Christian. Not that this is bad, but yesterday we went to a Hindu temple and I really wanted to talk about the deities so I feel very fortunate to have “Sak” as our driver, he said it is important not to eat meat when you visits the temple. The temple was so wonderful we were asked to dress modestly and to remove our shoes. As we approached the temple I could see the multiple bright colored murties and deities that towered high in the sky. I am sure I had a huge smile across my face as I asked Sak “is that Ganesha? Is that Lakshmi? Is that Krishna?…” Once we got there Sak told us we were lucky because there was a wedding that was ending. We saw the family gathered around as the new husband and bride walked out of the temple hand in hand. We also saw an old car that was pulled in pretty close to the temple with an old man walking around it saying mantra’s and making an offerings. (We found out later that this was a new car gift for the couple and the man was welcoming it into the family, removing evil and offering protection) after the man left we saw four limes smashed on the floor were the car once was (another way of removing evil). Inside the temple was stunning; it is outside so there was a ceiling held up by many pillars and a few different small rooms in the corners of the temple and one big room in the middle. Just like outside these rooms were dedicated to certain deities. The ceiling was beautifully painted of scenes from The Mahabharata, The Bhagavad Gita, The Ramayana, the Upanishads… It was wonderful to look at the ceiling and somewhat understand what was going on. Sak was very impressed as I eagerly asked to see if I was understanding the scenes correctly. He would then explain just a little bit more so I could understand more fully. I have studied and read these books many times and It was really nice going to something like this where I could feel all my love and knowledge bubbling up. He thought it was so cool that an American girl knew so much, he said do you study because it brings you happiness, peace, and makes you feel good. I replied “Yes!” As we were leaving the temple he said he knows someone who could burn me a copy of the Ramayana which is 30 DVDS. He also said he would find me some mala beads, and that I shouldn’t get them in Nadi because it would be too expensive and touristy. He also said his mom would make us some food on our next taxi ride. As we were heading back to our hotel we stopped at the locals market. It was great, rows and rows of fresh fruit. As I was browsing an older man approached me trying to read my back. I told them what it meant. By now two men were there asking where I study, and so we were talking about Krishna. The old man’s eyes were filled of joy and we kept saying to each other “Hare, Hare Krishna” and “Ram, Ram”. It was so wonderful he then gave me two ripe bananas held them to his heart and with his eyes still full of joy gave them to me. It was such a wonderful moment, my heart felt like it was singing, even though we could barely understand each other we had the connection “Hare Krishna” and “Namaste”. The man left and we continued to look at the rows of fruit and as we were leaving the man came up to me again “Hare Krishna!” this time he gave me a whole bundle of bananas and he stroked my arms. Another wonderful moment B). Sak who witnessed this last encounter said that was a true blessing that I was very lucky, and it meant very good things. He said whenever a situation like that happens (a blessing) and you get touched, it is God touching you. So wow what a wonderful day full of magic and love. As I look back over it I am reminded of The Bhagavad Gita. A simple narrated story about a young boy (Arjuna) deciding if he will fight in a war against his family and a conversation he has (with Krishna) while making his decision. All though this story sounds so simple it offers so much wisdom. For this story that the three ways to connect and serve Krishna (the Godhead). Through the body, action, karma. Through the mind, alignment, jnana. And through the heart, the will, attitude, bhakti. In Anusara we use all three Karma, Jnana, and Bhakti both on and off the mat. It was wonderful here. I broke my watch yesterday and so I have been on “Figi time” as the locals say. I wake up when the birds cheeps and the sun shines through my open window. I think it is around 5:30am. Today I woke up and walked down to the beach, sat on a rock and enjoyed the stillness of the morning. Waves crashing, birds chirping, breeze blowing, a few people strolling around and going to work. It was very nice. The last book of The Yoga Sutras talks in great detail about Samyama and different levels of Samyama. The practice of Samyama is takes a lot of practice. I asked Adam in our discussion “So how would I go home and start practicing this?” He laughed. But as I sat on the beach this morning being very aware of my surrounds as if I had 360 degrees of perception, yet at the same time my mind was still on this still, peaceful essence within myself (Shantaya) and it was as if I could feel my inner Shantaya pulsating (spanda) with the shantaya that I was surrounding by. And all though I could see a difference between the palm tree, the rock, the sand, the water, my foot…I could feel this unity. It was wonderful. Then I went on a run. Now we are getting ready for a full day on a sail boat. Activities we are planning on doing include reading, snorkeling, finishing, kayaking, scuba diving, beach combing, yoga, breathing, smiling…. Encounter 1: As I was walking around an old Hindi lady motioned me to come over to her as I approached she stood up and tuned me around. She took her finger and started running it over my Sanskrit tattoo on my back. She started to sound out the words “LOKAH SAMASTA SUKHINO BHAVANTU”(May all beings everywhere be happy and free and may the thoughts, words and actions of my own life contribute in some way to that happiness and to that freedom for all.) is across the top of my back and the om is in the middle). She repeated it multiple times running her finger over the top line and the pocking me on my Om. She did this a few of her friends gathered around me. They were laughing and very happy. The lady then looked down and saw the Buddha tattoo on my shin and started saying “Buddha, Buddha!” It was great. Encounter 2: I also had a nice connection with a man when I walked by a tourist store with many painting, and I pointed to a small one off in a corner and asked “Is that Hanuman?” The man’s eyes lit up and said yes. We then started to talk about the picture which depicts hanuman leaping over the ocean while carrying a mountain for Ram. We are going to go to this Hindu temple in a few days I am very excited. Om Namah Shivaya Gurave: The sound of the universe (Om), I bow down, I honor and I offer myself to (Namah) to the Highest, the Auspicious one (Shivah), who is the weighty teacher, that is within my own heart and outside of me (Gurava). As I say Namaste to the people as a way to say hello or good bye, I am reminded of the Anusara invocation. Namaste is a recognition of the goodness, the inner light, that is always present and is full of peace within me recognizing that same goodness, that sparkles and doesn’t depend on anything inside of them. Namaste reminds me of the deep unity that underlies all the differences that we encounter. Today we did lots of lying in the sun, enjoying lots of fresh veggies. I did a pretty intense asana practice in the sun, on the beach looking over the ocean. It was great. Lots of backbends, and really, REALLY deep lunges! I focused on deep lunges 90 degree angle at the knee working deep inner spiral while maintaining a low dorsal curve in the back (sign of thighs back).